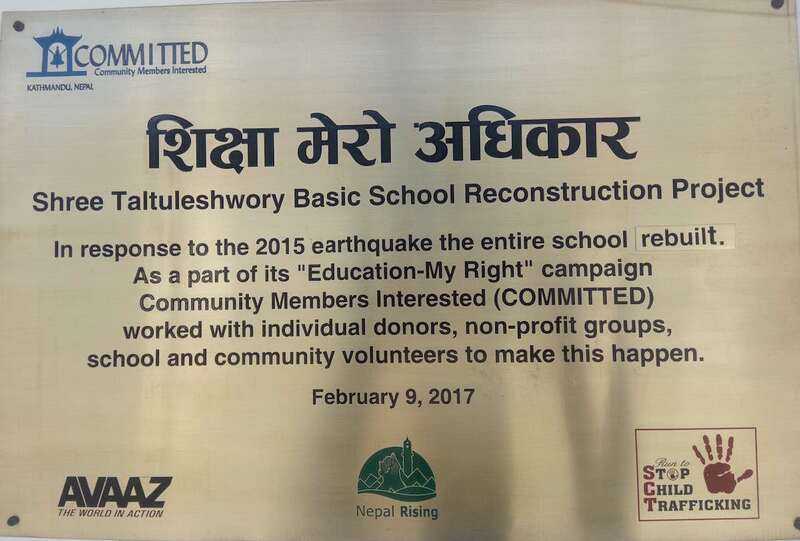 Since the massive earthquakes of April and May 2015, COMMITTED has completed assisting with the reconstruction of two schools in Thangpalkot: Shree Taltuleshwori Primary School and Shree Chilaune Secondary School. 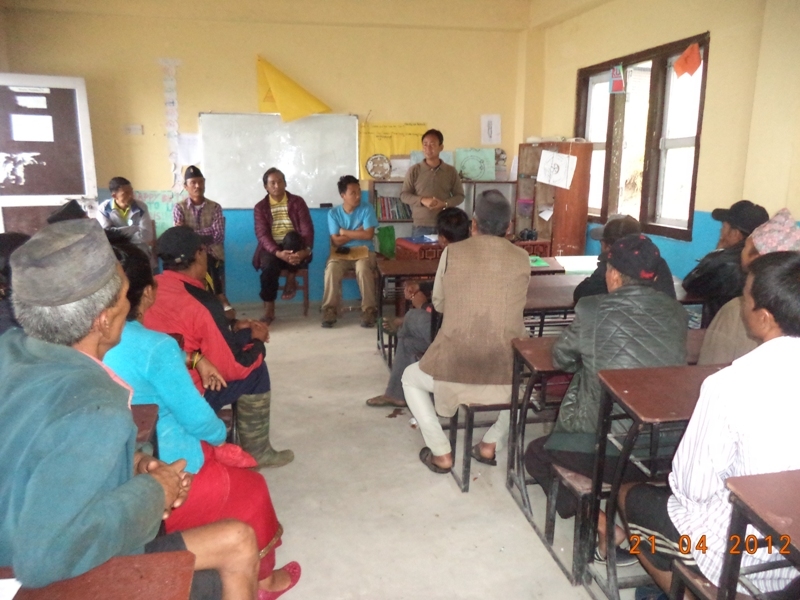 A glimpse of social audit at Chilaune School. After six months of sound teaching and learning environment at newly constructed and improved class room structures, COMMITTED held social audits of the construction work on 8th and 9th of August, 2017. The information related to project expenditure, funding partners and building utility were shared with those present by COMMITTED’s Project Coordinator and Finance Officer. The audience included members of the School Management Committee (SMC), Parent-Teachers Association (PTA), School Construction Committee, Chairperson and ward members of respective ward, and community members. 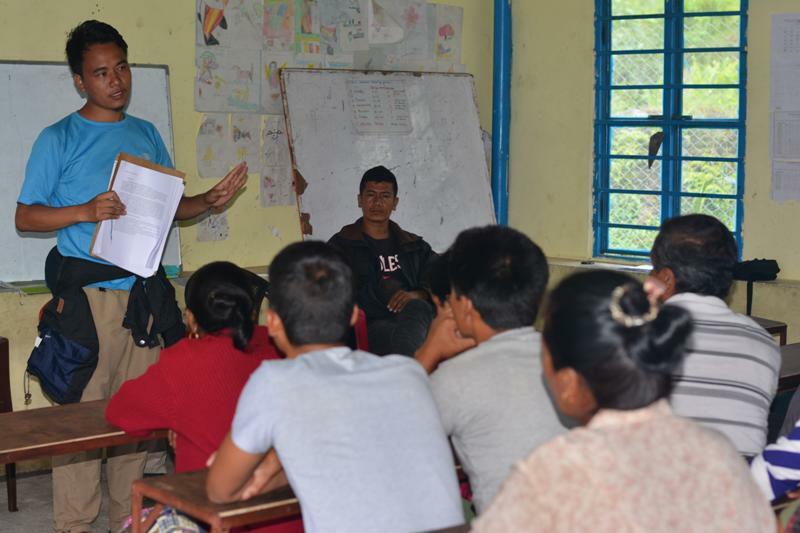 COMMITTED’s Project Coordinator (Education), Gautam Lamichane, talking to the attendees at Taltuleshwori School. Conducting social audits of projects is a legal requirement. However, COMMITTED carried it out NOT only because of that. We did so because we as an organization believe in transparency and accountability in general, part of the reason for our implementing the project Accountability and Transparency mechanism in School Governance System. Click here to go to a Facebook Post on COMMITTED’s page, posted on August 11 , 2017 showing a brief summary about social audits. 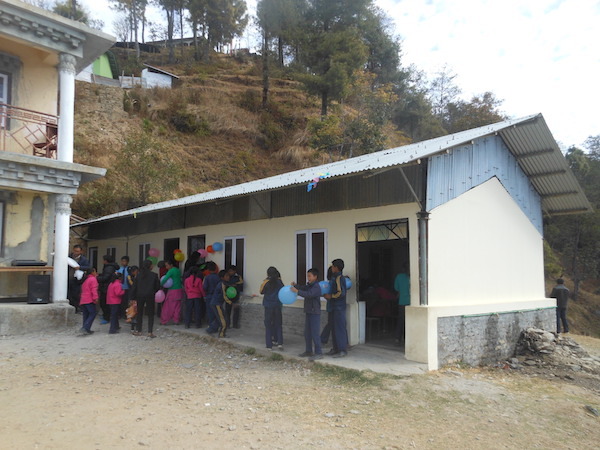 Click here to go to a blog post about handing over of Chilaune school. 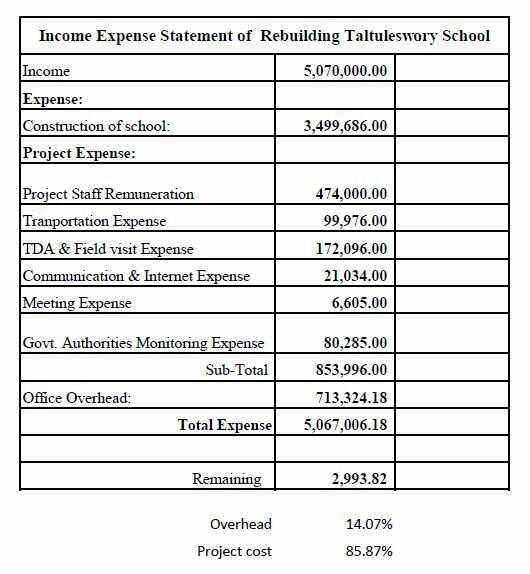 Click here to go to a Facebook Post on COMMITTED’s page, posted on October 28, 2016 about monitoring and assessment of Taltuleshwori School’s Phase-I project. 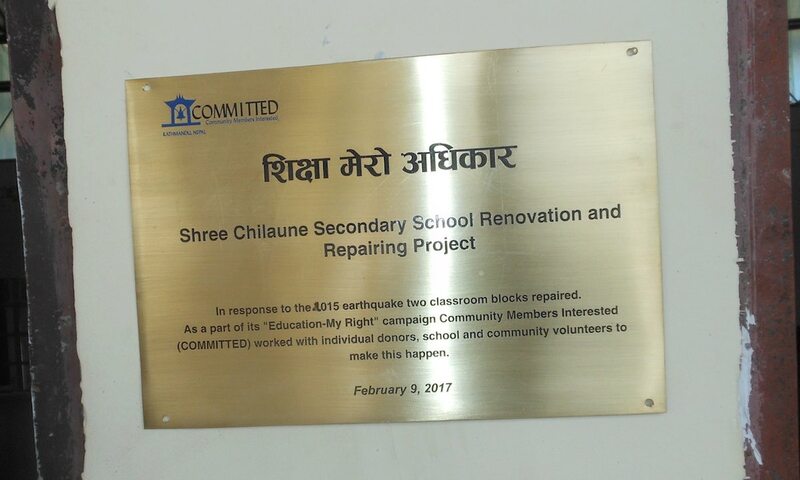 Following the April 25, 2015 earthquake, COMMITTED, in addition to providing relief and emergency assistance to the affected in Thanapglkot, supported Chilaune School with a couple of work. 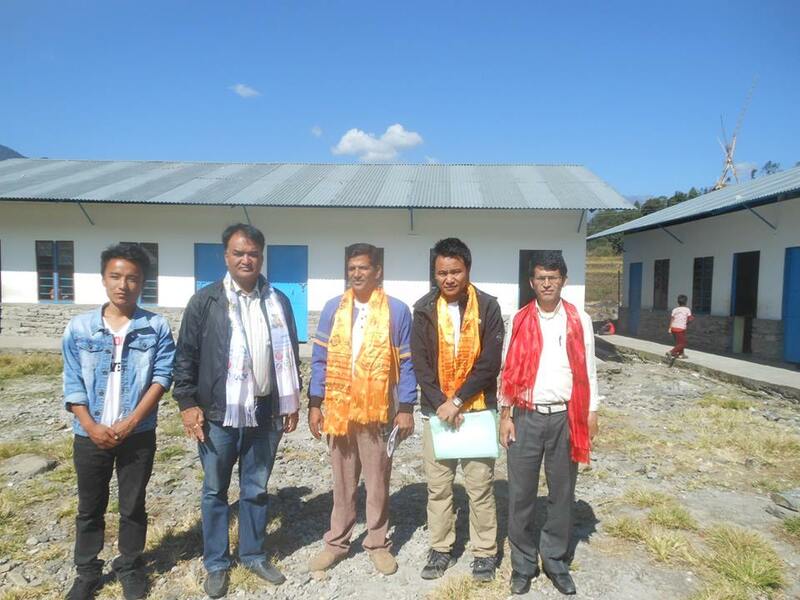 One was the reconstruction of two classroom blocks, which was handed over to the community last February. 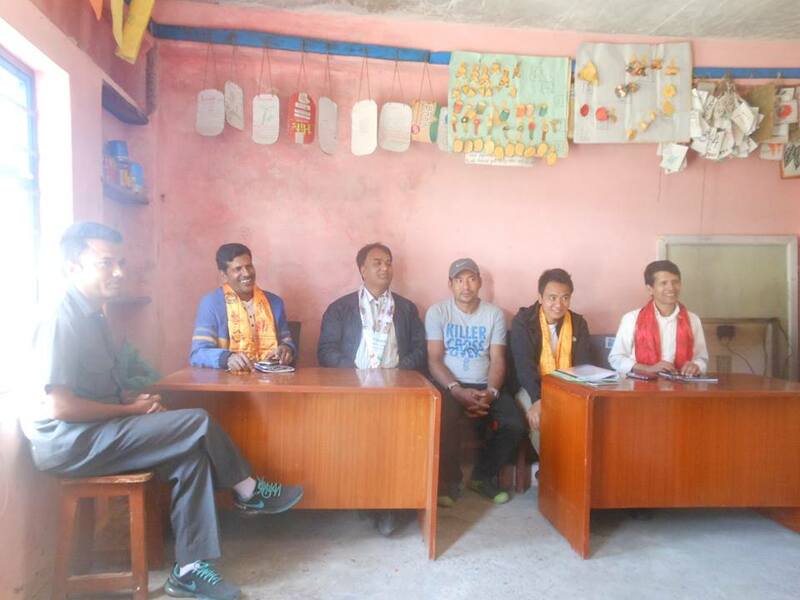 CMMITTED was represented by the Executive Director Jayjeev Hada, Senior Program Coordinator Kecher Acharya and Program Coordinator Gautam Lamichhane Magar at the function. Chilaune School children preparing the block for the function. COMMITTED Team Members with other officials after the inauguration. The other was funding the construction of a fence around what was originally conceived as the multi-purpose court. Construction of the court had begun just before the earthquake. Unfortunately, the quake damaged the court and it had to be fixed. 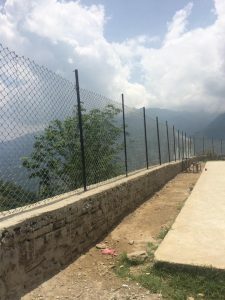 Both the fence and renovation of the court were carried out with left-over funds from the original multi-purpose court. The funding for the court came from Nemira, a business our friends in Switzerland run. Here’s a video of the progress of the construction and the condition of the multi-purpose court in May 2016. Click here to go a Facebook Post on COMMITTED’s page, posted on March 11, 2016, showing the progress of the reconstruction. Click here to go a Facebook Post on COMMITTED’s page, posted on March 16, 2016, showing the progress of the reconstruction. Click here to go to a Facebook Post on COMMITTED’s page, posted on Feb. 21, 2017, about the handover. 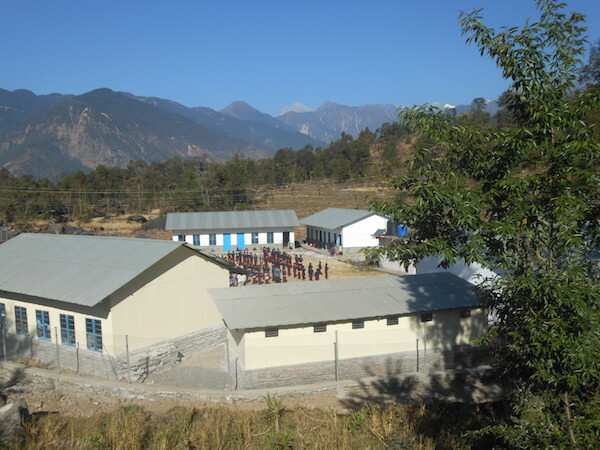 Click here to go to a Facebook Post on Chilaune School’s page also about the handover. 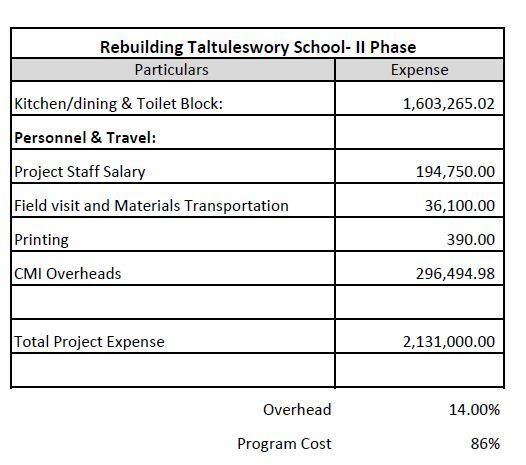 Click here for a blog post, published on June 21, 2016, containing financial details of the project as reported to the District Education Office the preceding week. Click here for the April 28, 2016 Facebook post about the progress of the project. 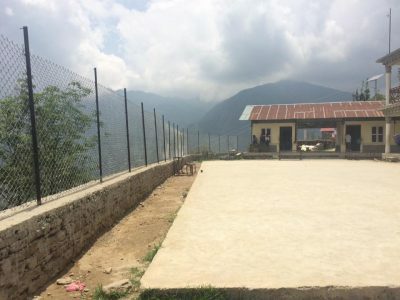 Click here for the March 12, 2015 Facebook post about our friends Michael and Elias’ visit to Thangpalkot when they committed to fund the construction of a multi-purpose court at Chilaune school. Click here for the March 14, 2015 Nemira Facebook post about Michael and Elias’ visit. 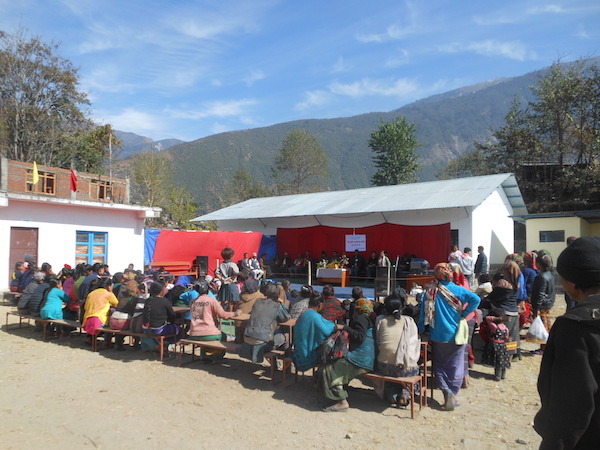 Last February, a little over a year since commencing the reconstruction of Taltuleshwori School in Thangpalkot, Sindhupalchok, we were finally able to hand it over to the community in a small ceremony conducted at the school. 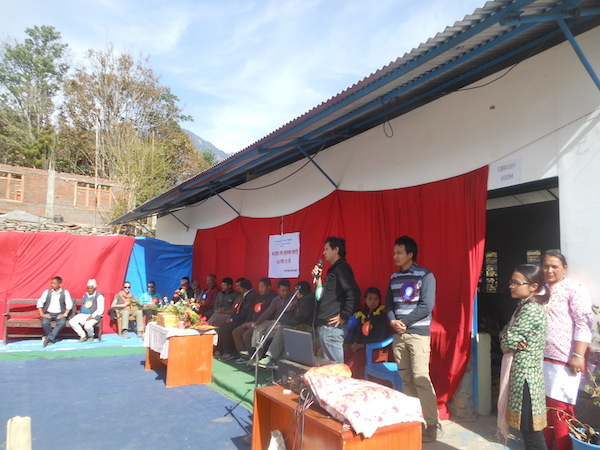 In addition to COMMITTED Team Members, including Executive Director Jayjeev Hada, Program Coordinator Gautam Lamichhane Magar and Senior Program Coordinator Khechar Acharya, members of the School Management Committee, school staff and local community members were present at the formal ceremony. A glimpse of the ceremony. Executive Director inaugurates the new school buildings. Executive Director Jayjeev, other COMMITTED members and school officials after the inauguration. Executive Director Jayjeev speaks at the ceremony. The school with the students on the grounds. As an organization, COMMITTED frowns upon such ceremonies and have been doing what it can to eliminate all or parts of such formal functions. More than anything, such functions in Nepal serve as platforms for people who have a knack for talking, among other things! Here’s what the school looked like in early May 2016 when school had resumed following the completion of reconstruction of most of the academic blocks. For more about the reconstruction of the school follow the links below. Click here for a Facebook post about the handover ceremony. Click here for the first (January 16, 2016) blog post about COMMITTED’s decision to rebuilt the school and the initial phase of the project. Click here for a February 2, 2016 update on the progress of the project. Click here for another blog post (published on Feburary 11, 2016) about the school and our efforts. Click here for a February 18, 2016 update on the progress of the project. Click here for a May 4, 2016, Facebook post about the completion of the first phase of the reconstruction project. Click here for a May 6, 2016, Facebook post about the progress of the reconstruction. 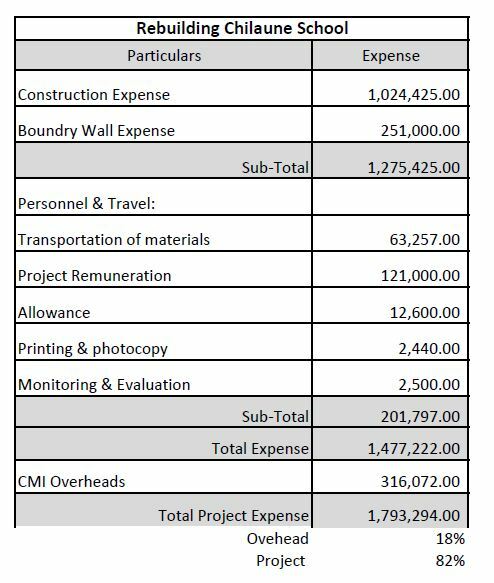 Click here for a blog post published on June 21, 2016 containing financial details of the project as reported to the District Education Office the preceding week. 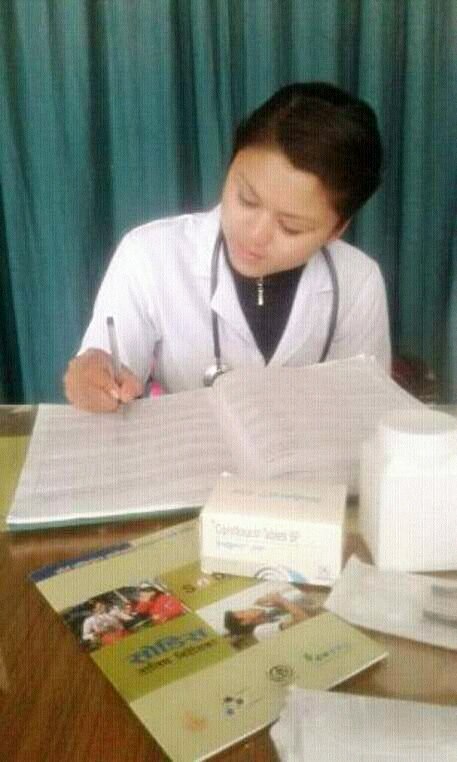 19 year old Prakriti Shrestha comes from a family with a weak financial background from the village of Gunsakot, Sindhupalchok district in Nepal. 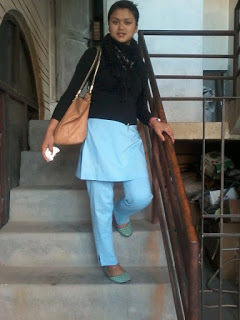 When in school, Prakriti was a very hard working student and she cleared her SLC (School Leaving Certificate) examinations from Raithane Secondary School, Thangpalkot with first division grades. Initially, because of her family’s financial hardships, her father and stepmother sadly wanted to marry her off. However through the fund raiser made possible by COMMITTED, Prakriti got a chance to pursue further education. In June 2013 when COMMITTED’s Education Program Director Dorje Gurung visited Thangpalkot and interacted with school students and shot a video for his ‘Education is Freedom’ fundraising campaign, she had expressed her dream of studying to be a nurse one day. Through the fundraising campaign we were able to raise Rs. 45,700 required at the start of the Associate/Auxiliary Nurse Midwife (ANM) program which Prakriti wanted to pursue. The rest of her educational expenses were covered by contributions from two other non-governmental organizations. 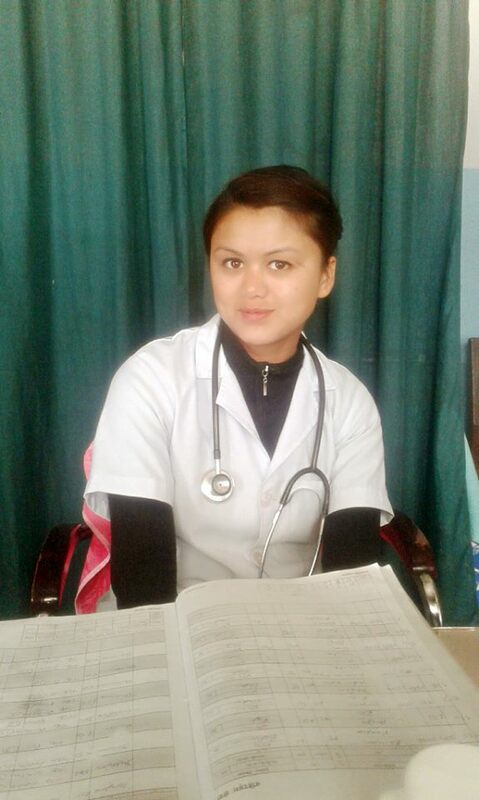 We feel happy to share that she has now successfully completed the 18 month long ANM course and is now awaiting her final examination results.